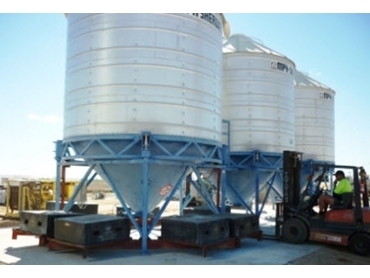 Silo Weighing Systems were certified for trade use by Accuweigh ’s QWM branch in Brisbane branch. BuySmart Ag Services in Moree, NSW invoices clients for the weight of product taken from the certified Silo Weighing Systems. Certifying the three Silo Weighing Systems required the complete removal of the out feed conveyor systems located under the silos to allow fitting of the steel frames used for holding the certified test masses. After weights testing and calibration, the conveyor and auger systems were carefully placed in position to ensure no interference with silo weighing accuracy. Each silo is fitted with 4 x 30t capacity Schenck industrial load cells for a silo weighing capacity of 60t each with the weight readings generate by A&D 4326 digital weight indicators. Accuweigh/QWM is Australia’s largest industrial weighing company and has eight branches across Australia providing scale service, scale testing and scale certifications on all types of scales and weighing equipment.